Last year I found that I was up against a wall trying to learn to fit a shirt So, I posted a shirt I knew was not fitted well and asked for help on this forum to work out how to fit it properly. I got a lot of feedback about it. I posted that shirt because I wanted to learn about it myself but having scoured the Cutter and Tailor fora and some others and also the limited literature on this topic I concluded, and I still think rightly, that there is not much written about fitting and it is not organised that well. I would like my posts to help others rather than to repeat what is already there to be found. posted in the professional section, but nothing teaches so much as doing. King Wilson’s book is brilliant. His work is really aimed at outerware and therefore the fitting of a jacket/coat rather than a shirt but the challenge is to extrapolate. I find King Wilson’s principles to be extremely clear so I will compare the advice I got on the forum with his system of identifying balance issues. King Wilson uses the terms: Major vertical balance, Major lateral balance, Minor vertical and Minor lateral balance. It is possible to characterise all of the elements of advice I got into one or another of Wilson’s categories. I will only discuss the first two, since my efforts only got to that point. You will have to review the rest by your self, or wait till I get time to continue. From the previous posts I have learned that there are a number of basic elements of fitting. A number of people, Terri foremost, said to begin with the balance. OJD said that it was a step he would do in the drafting stage. I confess that although I knew that I disliked shirts that were out of balance I had absolutely, not the slightest idea of what balance was. There were several extremely important ideas put forth in these posts about balance. Posaune and Peterle described balance like a swing, where the side seam is like the ropes that hang down to the seat and the axis is in the shoulder. 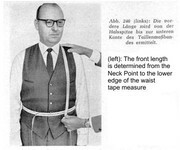 Schneidergott showed a brilliant method for measuring balance using two tapes, one secured horizontally around the waist while the other measures each distance, front and back, from the shoulder point or neck point down to the tape at the waist. This illustration shows how to measure the front, beginning to make the comparison between the front and the back. After the shoulder point to front waist is measured the shoulder point to waist at the back is measured. Commonly, there will be a difference in these measurements - that is called, front balance (too much length found at the front or back balance excess length found at the back. Posaune said that "There are several ways to achieve balance and all are correct." After spending some time absorbing this information I would like to show how I have understood this part of fitting and show some distinct ways of balancing the bodice of a shirt. Corpulent isn’t the only condition that adds length to the front, a well-developed chest and an erect posture can tip the front into excess with respect to the draft. The main part of what the forum members describe as Balance is in fact what King Wilson describes as Major Vertical Balance. I have understood balance in the bodice in the form of a bell: the axis is within the scye, the side seam points to where the bell is pointed and the persons body is like the tongue of the bell. When you see an out of balance shirt it disturbs the mind because it clashes and you know the thing wants to fall back to rest. Likely causes of this form of vertical balance error could be 1 – Erect posture 2 – Stooping posture, respectively. a: add a portion of vertical length to the front, +/- remove a portion from the back within the scye itself. b: add a portion of vertical length to the front at or closely below the bust line. 2: King Wilson discusses the method of passing down the front or passing up the back. At first sight, this very similar the first method until one realises that it means that all the increase occurs in the scye. One thing that quickly becomes obvious is that any change within the space of the scye will change the shape and balance of the scye and that will mean the sleave will have to be altered. If the amount is small, then it doesn’t matter too much. If the amount is big, the measured difference between my own front and back was 2 inches (5 cm), that is too much to place into the front scye alone. So, a portion can be placed under the scye close to the bust line. Posaune showed me a very interesting way to add front length while minimising the disturbance to the scye by adding an angle from the centre of the scye to the front of the garment. Since the axis of the shirt, like the bell or the swing is inside the shoulder and therefore more or less the middle of the scye, a wedge added from that location will give the full amount at the centre front but only a smaller portion at the front seam of the scye, clever! I chose the first method of vertical balance correction, adding length within the scye and just below the bust line, not for any particular reason except I could understand it easier. I knew I didn’t want to put all the extra length within the scye and I hadn’t had time to digest posaunes method fully. You can see the angle of the side seam and hem. It may have been a bit over compensated but I believe I was leaning forward a little too much. In any case you can see the change in the side seam angle. Also there are still folds related to the scye which is likely too high, or equally the shoulder angle is too straight. In any case my point is to show the corrected side seam. Here is an example, using a different person, who is more proportional and so doesn’t have so many other fitting issues, where I drew the changes straight onto the draft. The presence of large diagonal cloth folds from the neck downwards and out to the side seam can be indicative of a problem of major lateral balance. Martin, posaune and terri all discussed the method of adding length to the cloth at the neck point without altering the shoulder point. Since this correction disturbs the shape of the neck seam posaune showed a method of redrawing the neck shape by passing a template of the existing neck up the centre front line in the amount added to the neck point to keep the shape. Imagining visual signs and effects of incorrect lateral balance proved to be not as easy as for vertical balance. I have however come up with some hasty impressions. The second is to show an equivalent action that would produce the appearance of a Major lateral balance fault. Not a good look for a Gentleman, really. Well I hope this essay has helped some beginners who like me had not had any exposure to the concept of balance in shirts. I'm going to be following this with great interest as I am also struggling with fitting a basic ladies shell top with sleeves, a simple garment, but one that must fit well to look good. So Schneiderfrei, thank you for starting the thread. Actually its been on the CandT site for a couple of years. I have done this to refresh the post after photobucket stopped hosting images recently. Wow, this looks like a really well thought-out and helpful post. Thank you for posting it up, Schneiderfrei. Photobucket has played hell with C&T, has it not? Oh! Hasn't it just. I refuse to continue to suffer under them. I am working toward re-posting almost all of my stuff. It turns out you can view and save the images from photobucket but it is laborious. Who is the good person who re-posted all the images?? It looks like Postimage will still host third party. Hmm. Perhaps I will use them too. It's just a bit of an ad really, from the 50's. But here is another take on measuring the balance. You can still buy them actually. If you take this measurements for balance alone they are not able to do the job. Maybe enough for a (roomy) great coat. Is there more text? Thanks for that clarification. Very important. I know there are also additional balance measurements for trousers.